If you have bugs in your fuel/ oil you can expect a notable improvement in power, fuel use savings* around 5%+ in and filters will last normal service intervals. 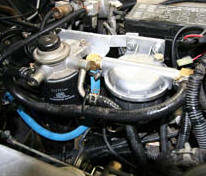 Injectors and fuel won't block or corrode because of the diesel bugs. For: Diesel fuel, marine diesel, light oils, gas oil, jet, kerosene. Engine Ratings: 100 to 500 horsepower. Max Hourly Flow Rate: 500 litres per hour. Materials: LM6 - marine grade, anti-corrosive aluminium alloy. Size: 127mm wide, 160mm high, 115mm deep. Port Size: 1/2 inch National Pipe Thread tapered or British Standard Pipe Thread. 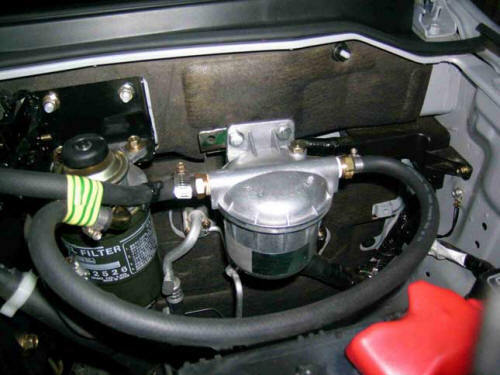 The L500 De-Bug Unit is the size of a typical filter housing and is easily installed to the fuel line before the primary filter. 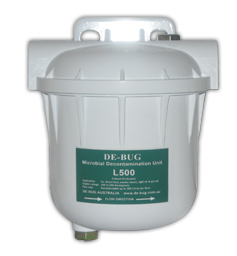 As most Diesels have recirculating fuel systems, the diesel is continuously passed through the L500 De-Bug Unit to provide systematic destruction of microbial contaminants in the fuel tank. Your filters remain clear of slime and the engine will retain operating efficiencies longer over service cycles. All of these benefits are permanently achieved without the use of any biocide chemicals. Provided the unit is properly fitted and used, the L500 De-Bug unit is guaranteed to significantly reduce microbial contamination. The L500 De-Bug Unit is unconditionally guaranteed against manufacturing defects for 12 months.